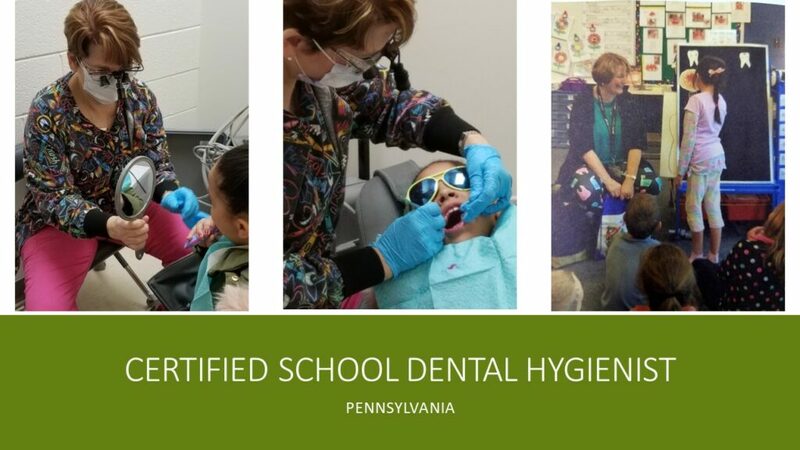 Certified School Dental Hygienist - PDHA – Pennsylvania Dental Hygienists' Association, Inc.
A certified school dental hygienist is a valuable member of the Pupil Services Team in a school district. Like a certified school nurse, this employee is paid on a teacher’s contract and receives the benefits that a teacher receives. • Adolescent and child development. 5. A supervised practicum (at least 60 hours) serving as a school dental hygienist. The practicum may be met by working on a Pennsylvania public long-term emergency certificate under a certified education specialist – school dental hygienist. If the Local Education Association does not have a licensed hygienist, the principal may supervise and a certified hygienist from a neighboring district may mentor the candidate. PDE has a list of certified hygienists willing to mentor. Until this process is complete, the school should apply for an Emergency Certificate from the Department of Education. Emergency certificates are submitted through the Teacher Information Management System (TIMS). A certified school dental hygienist writes a dental hygiene services plan for the unique needs of the employer school district. Aspects of this plan may include: classroom dental health education; operation of a fluoride supplement program, dental screenings, and preventive services (if one is a PHDHP) to include prophylaxis, sealants, X-rays and fluoride treatments. A certified school dental hygienist wears many “hats.” A certified school dental hygienist can be an educator, a clinician, a social worker, an advocate and an administrator – sometimes all in the same day!